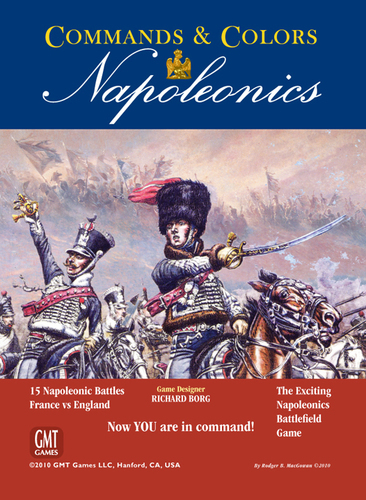 The Napoleonic historical period has always been one of our favorites and was actually the second historical game that we developed using the Commands & Colors system. 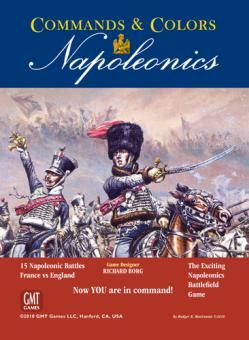 The C & C: Napoleonics rules at first glance may seem more complex than other Commands & Colors games, but if you are familiar with the game system, you are only a few short steps away from taking Command. 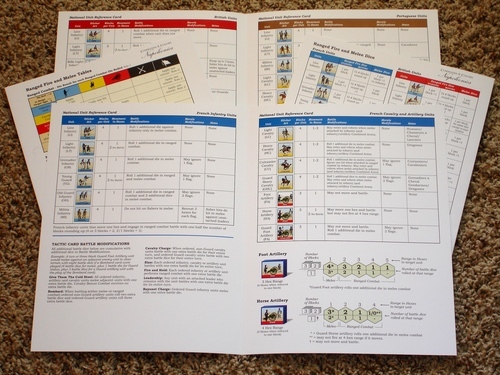 Even if you have never played before, learning the fundamentals of the game system is straightforward and will be an enjoyable endeavor. 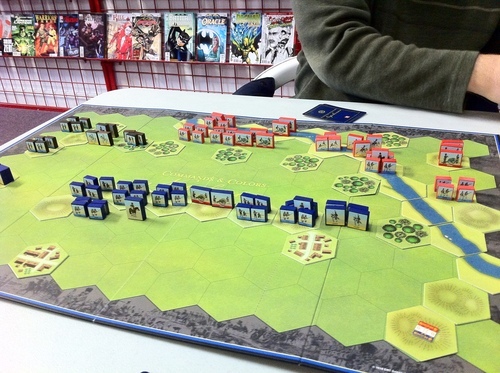 For the game group in Orlando, C & C: Napoleonics is one of our favorites. There is a wealth of subtle and bold features that set it apart from other historical periods and it truly embraces the tactical doctrines of France and the various nations that fought against Napoleon. ·The Napoleonic period showcases a unique balance between the roles of Infantry, Cavalry and Artillery on the battlefield. ·In combat, a unit's battle strength is directly tied to the number of blocks present in the unit. Therefore, as a unit suffers block loses its combat effectiveness is reduced. ·An Infantry unit, by forming square, can reduce the effectiveness of the most gallant Cavalry charge. ·Artillery in combined arms combat along with an Infantry or Cavalry melee attack can produce the most devastating results. ·As with other Commands & Color games, the battle dice resolve combat quickly and the Command cards provide a fog of war and will present players with new challenges and opportunities for victory. ·When in Command, the battlefield tactics you will need to execute conform remarkably well to the historical advantages and limitations inherent to each Napoleonic Army. 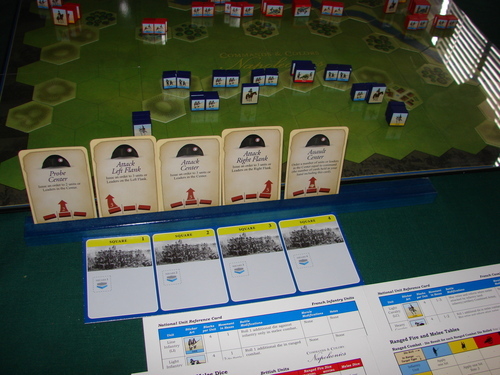 For example, as the French Commander you will want to maneuver your infantry units into a position to take advantage of their melee attack dice bonus. While a British Commander will want his line infantry to take up a defensive position and stand and volley fire with a dice bonus. The other major powers also have similar seemingly simple advantages that can impact a battle and will influence your Command style for that army. The core C & C: Napoleonics game will feature French, British and Portuguese troops, while the expansions will showcase one Coalition army that opposed Napoleon. 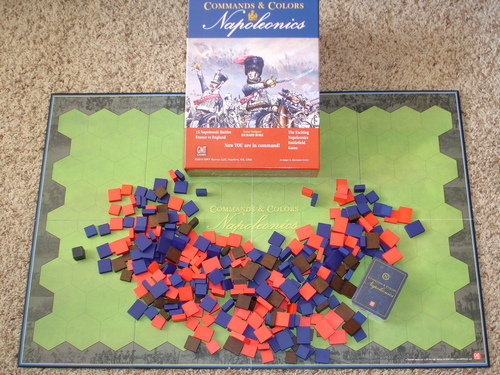 The Napoleonic historical period is one of my favorites and although it has taken some time to bring it to market, I truly believe, after working with the guys at GMT on Commands & Colors: Ancients, this will be a perfect fit and another outstanding game product. 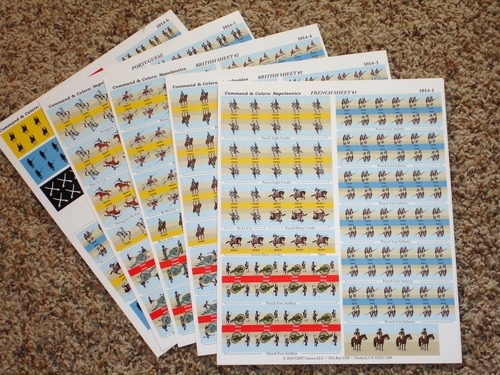 As with other games in the Commands & Colors genre, units in both armies can only move and fight when ordered. The command playing cards supply those orders, providing an element of luck that creates a fog of war and presents players with both challenges and opportunities. You must maximize your opportunities by playing your command cards judiciously. How well you handle the diverse units, their weapons, and the terrain, will determine victory.